5 starsNice to see Obi-wan, Ferus, and Trever again. Glad they were able to find more Jedi. Good to see that resistances are popping up. Hope Obi-wan will do well when he goes back to watching over Luke. Can't wait to read Star Wars: LOTJ: Underworld!!!! Ferus Embraces His Destiny & Receives a Dark WarningDark Warning is the second book in the Last of the Jedi series that focuses on former Jedi padawan Ferus Olin. This edition picks up where the Desperate Mission left off, with Obi-Wan Kenobi having rescued Ferus Olin and picked up a street smart orphan named Trevor. Several thrilling escapes force the group to divide on separate missions in this edition and Ferus beginning to embrace the Force again. Another action packed thriller with wonderful character development from the amazing Jude Watson. Now I feel the living ForceI read the book one quite a while ago and wasn't exactly fond of it. Now I see why, book one is like an introduction to the main cast, an appetite before main course. In this book the events get intense, actions pact in, and plots start showing twists. At places as remote as outer rim and as central as Coruscant, across the entire turmoil galaxy, the seeds of rebellion have been planted. It is thrilling to feel a gathering storm. Can't wait to read the next book. Rediscovery.More discovery of who the Jedi are. New stellar base. Padawans becoming Jedis. Deadly operations and a young man learning the ways!!! A decent follow-up to the first book of this series. The pairing of Kenobi and Olin is truly wonderful to read. In another universe, Olin should have been Obi-Wan's apprentice. The characters mesh so well together, and throwing them up against one of the galaxy's greatest bounty hunters is a fantastic concept. It's nice to see Obi-Wan finally re-entering the fray, and interesting to see him struggle not only with his duties to protect Luke, but also with his allegiance to the now old Jedi ways. I always love a good non-stop Star Wars book. Every chapter, at least one fight scene occurred. The creative fight scenes, accurate to the mechanics of Star Wars, just made me love the series more. The characters, besides Obi-Wan, didn't had much depth, but their subject matter was unimportant relative to-guess what?- the incredible fights. It's been a while since I've read a good action book, and this was a great refresher. Its cool, I haven't read the first one yet but I have read the Jedi Aprentice seares and the jedi Quest seares and number 7 of the last of the jedi and so i think i need to read this serares. so far Obi-Wan, ferus and trever have had a space port bral, escped boba fett, crashleded on a planet at war and now they are ecaping the lost battle with the leaders of the risistence leader. so it's going rely epicly. I though this book was amazing. If you liked the first book you'll love this one even more. I have to admit I like Star Wars books but even if you don't I think you would still love this book. Obi-Wan is a awesome jedi and Ferus is also a pretty sweet character. They are both mostly jedi but Ferus never became a knight he was only an apprentice. I would recommend this book the anyone who is looking for a sci-fi action packed book. Obi Wan and Ferus have to find a safe haven. Ferus is determined to find all the jedi who are still alive. There's a lot of battles in this book but it does move the story on. Obi Wan is still trying to protect the existence of Luke and Leia. If you like constant action, then this is the one for you. 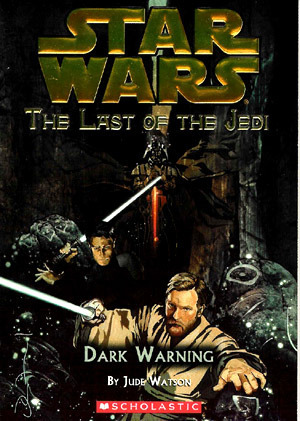 The Dark Warning by Jude Watson is about Ferus Olin, a recovering Jedi who chose to leave the Jedi and now comes back to find the last of the Jedi with Obi-Wan Kenobi. The book is written very well, the theme is clearly there and there is a ton of suspense. I think it should have gone a little further into Ferus's past but other than that it is a well written book. Luke Skywalker is a jedi and is put into a mission to attack the death star. At the death star a great evil is there called Drath Vader. I wanted to read this book because I never saw the movie. I like this book because HE gave me more details on Luke Skywalker and his past. WARNING!!!!!!!!!!!!! SPOILER ALERT!!!!!!!!!!!!!!!!! Just as good, if not better, than the first one. I like how it shows the roots of the Rebellion starting to take hold. The third one should be good. Another from Watson. A lot happens, but often seems to be happening too fast. They jump from one moment of danger to the next. It gives the entire book a feeling of melodrama. Dark Warning was a great book!! It was descriptive,funny in parts and planted good pictures in your mind!!!!! My favorite part was when Ferus got a lightsaber and fought off alot of stormtroopers. Nobody writes Star Wars quite like Jude Watson; she does her usual great job again in this book. See my review of the other edition. My kids were absolutely on the edge during this one. What a fun series. Slightly less manpain than the first book, but there are still passages/moments in this that get you right in the feels. Right. In. The. Feels. The story was a little too short and didn't really have a lot of "meat" to it but it was enjoyable enough. I will continue on to the next volume.